"The End of the World will come, so it is said, so it is told. Our end will come when there are no more trees. Then, when all are cut down, when people are everywhere, when there is no more forest. So it is said, so it was told by the ancient habo-people." "Kaxon bake xen, well, if it is true, if the forest is overcrowded by people, if there are settlements all over, built up by the kah-people, which are settling close together, when all the trees are cut down, when there are no more mahogany trees, when all the trees are destroyed, when only the hills remain, then the end of the world will come. Not now, but very soon. The end will reach us. This is said. Our end will come. Nothing will be left of us." "It is said, but who really knows, if it will be a storm or if it will be the sun which will burn us, which will destroy us. Fast, very fast the end will reach us. It is said, it will only last as long as dawn lasts, as long as the sun needs to reach the treetops. Fast it will be. And nothing will be left of us. One hour and we are all gone." "Perhaps a great coldness will come or something else. Hachykum, Our True Lord, will get our blood. He will gather all of us there in Yaxchilan (at the center of the universe). The Gods will bring us to Yaxchilan. All the people with good blood will be gathered. When they arrive there, their necks will be cut. So it is said." "Then, when the world's end is coming nothing will remain. Everything will find its end. There will be no thorns and spines, no flies, no bloodsucking bugs - nothing. But then the souls will come, the souls of the ancients, the souls of the deceased. They will inhabit the earth. They will stay together with the gods." "Eat, eat so long as there is bread. Drink, drink so long as there is water. A day will come, when the dust will darken the sky, when a stench of pestilence will cause the land to wither, when a cloud will rise, when a mountain will be raised, when a strong man will seize the city, when all things will fall into ruin, when the tender leaf will be destroyed, when all eyes will close in death." The canonical dates (according to Ehran the Scribe) on the ends of the Fourth, Fifth, and Sixth worlds are August 12, BCE (the fall of Atlantis), December 24, 2011 CE (the appearance of Ryumyo), and April 4, 7137 CE. This gives 5123-5125 years per mana cycle [1,871,270 days for the Fifth World's duration, and 1,871,969 for the Sixth World's]. The Mayan Long Count suggests 1,872M days, or 5125.36 years. It also seems that Ehran's dates are a year late. The end of the Mayan Great Cycle after the completion of the 12th Bak'tum. It's either the 21st or 23rd December, 2012 depending on whether you use the 584,285 or 584,283 correlation coefficient. On the last day. It has already happened, at least for the Mayans. 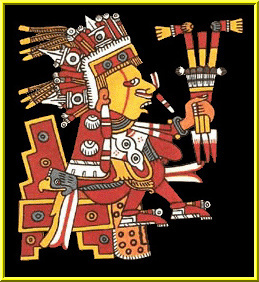 According to Mayan calculations, the current cycle of the world is due to end in December 2012. There is some disagreement over whether the end of the current cycle of the world will involve the end of the world itself. 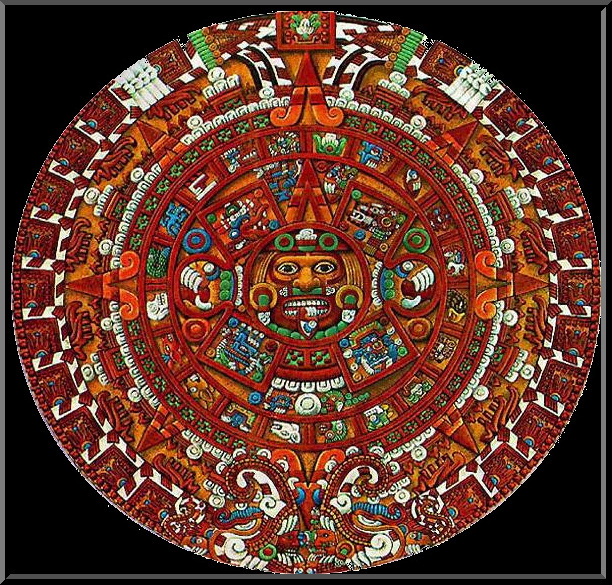 Ehran the Scribe: The Mayan calendar is the most amazing, as it contains a complete description of the magic cycles, including this current crossing of the Threshold. The Mayan calendar was created in the year 3372 BC (using the Christian calendar), just at the end of the last cycle. The Mayans described the cycles as "worlds" and stated that only certain life forms made the transition from one world to the next. The calendar, written over 5,000 years ago, predicted the exact day the Threshold Level would be passed. If the Mayan dates are converted to the current Christian calendar, it correctly states that the Threshold would be passed on December 24, 2011 AD. On that day, the first Great Dragon was seen in Japan. The precision is amazing. Atlantis sank on August 12, 3113 BC, thus marking the end of the Fourth World and the beginning of the Fifth. The Sixth World began on December 12, 2011 AD, and will end, according to the Mayan calendar, on April 4, 7137 AD. We have the intervening time to enjoy what the Great Mother gives us and to use responsibly the double-edged sword of technology that our human cousins have created. We must use both the energy of nature and the power of technology to try to fix the damage done by our short-lived relatives. David Wilcock says: Clearly, the Maya put a great deal of work into this cycle and it appears that they were warning us that this cycle causes periodic, massive cataclysms. The more we find out about this cycle, the more we want to know when it will be. And the near, unanimous conclusion is that the end date is December 12, 2012. The champions of the 12/12/12 school (December 12, 2012) make arguments that appear to be logical. They are in fact, bits and pieces of evidence that loosely fit into this date as accurate, such as the approximate time for the turning from the Age of Pisces to the Age of Aquarius as 2011. In addition, this demomstrates how the planet Venus behaves in very unique ways at both the beginning and the ending of the commonly used set of dates. This has to do with rising ofVenus on the horizon at dawn during a certain specific time of the year. The Mayans know this as The Birth of Venus. Researchers such as Terence Mc Kenna who claim that Earth comes into alignment with the center of the Milky Way Galaxy at this date, and that linear time breaks down at that point. The date December 21st, 2012 A.D. (13.0.0.0.0 in the long count), represents an extreemely close conjunction of the Winter Solstice Sun with the crossing point of the Galactic Equator (Equator of the Milky Way) and the Ecliptic (path of the Sun), what that ancient Maya recognized as the Sacred Tree. This is an event that has been coming to resonance very slowly over thousands and thousands of years. It will come to resolution at exactly 11:11 AM GMT. 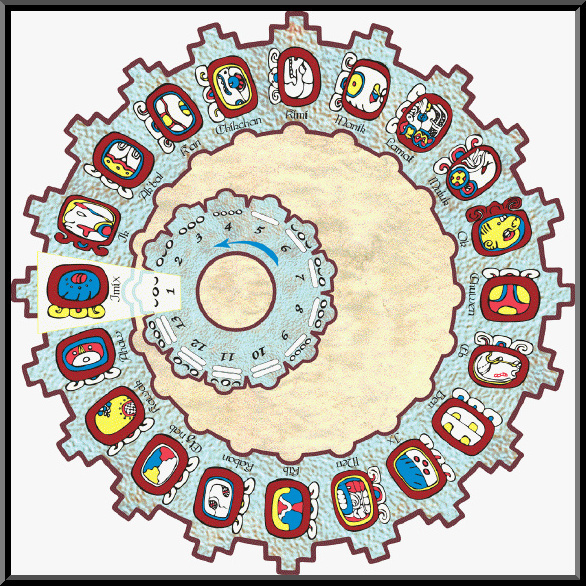 The Tzolkin is a 260-day calendar based around the period of human gestation. It is composed of 20 day-signs, each of which has 13 variations and was (and still is) used to determine character traits and time har-monics, in a similar way to Western astrology. The Maya also used a 365-day calendar called the Haab, and a Venus calendar plus others. Mayan scholars have been attempting to correlate the Long Count with our Western Gregorian calendar since the beginning of this century. There has been a massive var-iation in the suggested correlations, but as early as 1905, Goodman suggested a correl-ation only 3 days from the most popular one today. Known as the GMT correlation, or "correlation #584283" this was finalized in 1950, and puts the start of the Great Cycle (day 0.0.0.0 on August 3114 BC, and the end-date (known as 13.0.0.0.0.) as 21st December, 2012. 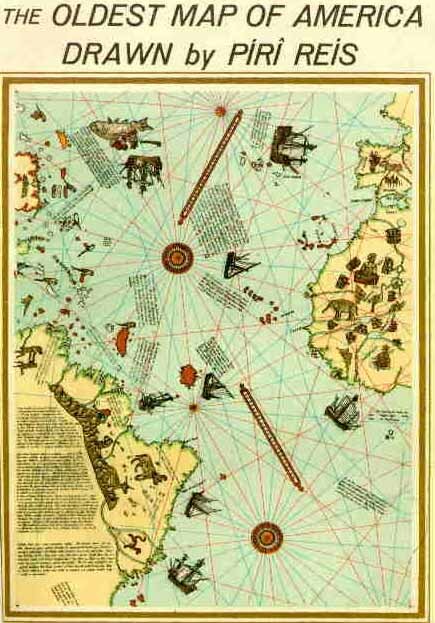 The Tzolkin schollar Jose Arguelles has pointed out that the Tzolkin is a harmonic of the Great Cycle and can be used to map history, as if it is measuring not individual ges-tation, since 5 Great Cycles add to exactly 26,000 Tuns; the "Grand Year" or precession of the equinoxes - a higher harmonic of 260. According to many prophecies, something important is about to happen in 2012 AD. In 2012, the center of the Galaxy is at 0 degree of the Western zodiacal sign Capricorn. Zero degree Capricorn is the point of the zodiac where the Sun is during the December solstice. At December 21st, 11:12 GMT during the December solstice, the Sun is at the exact center of the Galaxy. According to the Mayas, the center of the Galaxy is the cosmic womb; the place of dead, transformation, regeneration and rebirth. This moment shows the end of their calendar. 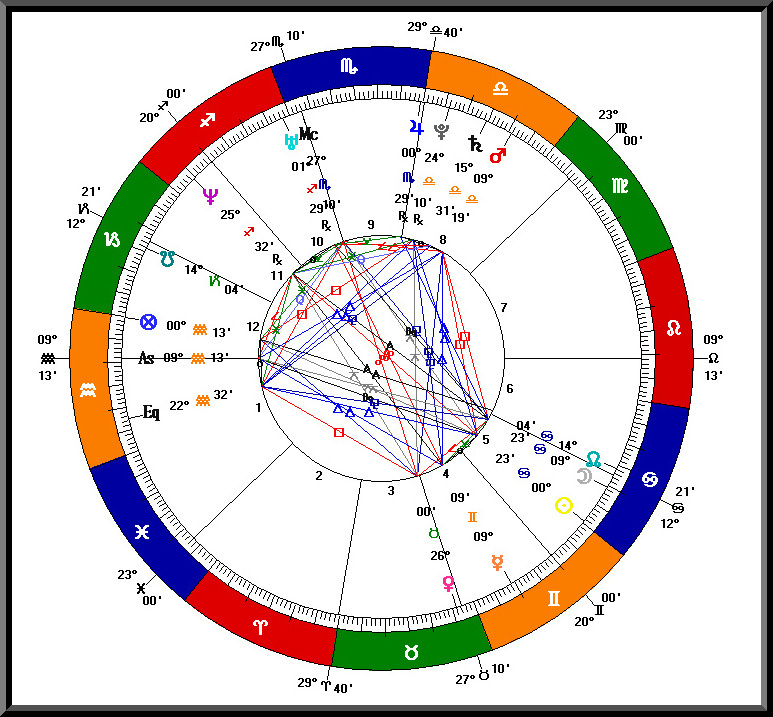 To know more about what this means, it is interesting to make an astrological chart of the December solstice of 2012. Below is a chart for the 21st of December 12.12 Middle European Time (11.12 GMT), Amsterdam, Netherlands. The planetary pattern will be the same for all locations only the ascendant and house division will be different. The Sun is at 0 degrees Capricorn, the point of the December solstice. It makes a sextile to Neptune, right at the beginning of Pisces. This is an almost exact sextile. The orb is less than half a degree. This aspect can point towards a spiritual experience, a loss or both. The most important configuration is a yod which is found in the chart. This is also called the "Finger of God." It looks like an arrow in the chart and it indicates change and transformation. 1.A quincunx (150 degree aspect) between Jupiter and Pluto. 2.A quincunx between Jupiter and Saturn. 3.A central opposition (180 degree aspect) made between Jupiter and the Mercury/Venus conjunction. The two quincunxes are almost exact, they have an orb of less than half a degree. In fact, the quincunx between Jupiter and Pluto is exact at December 21st, 2012. Pluto is the planet of radical transformation, death and rebirth. Saturn is the planet of the earthly realm and of learning experiences, especially those of a more painful nature. Jupiter is the planet of expansion. It is the focus of the yod, the planet which receives the strong energy of the other planets involved. It also expands the energy of the other planets involved, especially Saturn and Pluto. This yod indicates transformational processes which can be painful for many. Jupiter has a central place in this because it is the focal point of the energy. This indicates changes in our religious systems, beliefs, philosophical systems. These fall under Jupiter. Another notable configuration is the T-square with Neptune as the focal point. "The Fourth World shall end soon and the Fifth World will begin. This the Elders everywhere know. The Signs over many years have been fulfilled and so few are left"
These are the Signs that great destruction is here: "The world shall rock to and fro. The white man will battle people in other lands, those who possessed the first light of wisdom. There will be many columns of smoke and fire such as the white man has made in the deserts not far from here. Those that stay and live in places of the Hopi shall be safe. Then there will be much to re-build. And soon, very soon afterward, Pahana will return. He shall bring with him the dawn of the Fifth World. He shall plant the seeds of his wisdom in our hearts. Even now the seeds are being planted. These shall smooth the way to the emergence of the Fifth World." 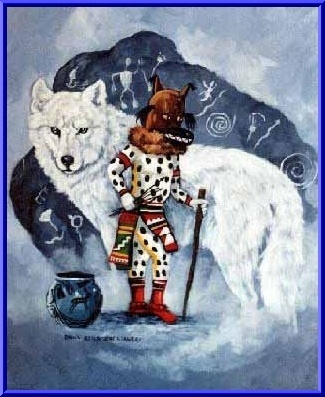 Emergence to the Fifth World: "The end of all Hopi ceremonialism will come when a Kachina removes his mask during a dance in the plaza before uninitiated children. For a while there will be no more ceremonies, no more faith. Then, Oraibi will be rejuvenated with its faith and ceremonies marking the start of a new cycle of Hopi life." "World War III will be started by those peoples who first revealed the light (the divine wisdom or intelligence) in the other old countries (India, China, Islamic Nations, Africa). The United States will be destroyed, land and people by atomic bombs and raidoactivity. Only the Hopis and their homeland will be preserved as an oasis to which refugees will flee. Bomb shelters are a fallacy. It is only materialistic people who seek to make shelters. Those who are at peace in their hearts already in the great shelter of life. There is no shelter for evil. Those who take no part in making of world division by ideology are ready to resume life in another world, be they be Black, White, or Yellow race. They are all one... brothers." "The war will be a spiritual conflict with material matters. Material matters will be destroyed by spiritual beings who will remain to create one world and one nation under one power, that of the Creator." ceremony. It was sung in 1914 just before World War I, and again in 1940 before World War II, describing the disunity, corruption and hatred contaminating Hopi rituals, which were followed by the same evils spreading over the world. This same song was sung in 1961 during the Wuwuchim ceremony." "The Emergence to the future Fifth World has begun. It is being made by the humble people of little nations, tribes and racial minorties. You can read this in the Earth itself. Plant forms from previous worlds are beginning to spring up as seeds. This could start a new study of botany if people were wise enough to read them. The same kinds of seeds are being planted in the sky as stars. The same kinds of seeds are being planted in our hearts. All these are the same, depending on how you look at them. That is what makes the Emergence to the next Fifth World. These comprise the nine most important prophecies of the Hopi, connected with the creation of the nine worlds; the three previous worlds on which we lived, the present Fourth World, the three future worlds we have yet to experience, and the world of Taiowa, the Creator, and his nephew, Sotuknang. One of the prophecies- All Indians and Non-Indians would one day begin to understand a great problem facing all people. Someday, a white brother who went away to record things will return to this land and bring spiritual life to the continent. When White Brother returns, Hopi must keep their spiritual ways so they can show others how to live the right way. 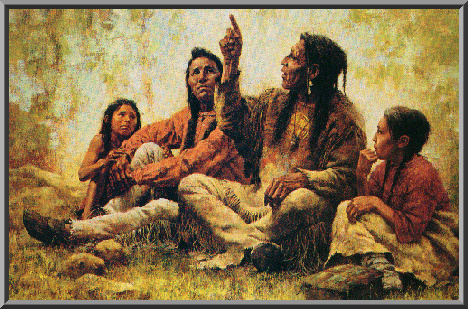 Elders know ancient knowledge, which will be shared at the right time with all. Based on prophecy, Indians welcomed the white man. White man destroyed privilege. Indians gave hospitality and whites took everything. Whites tricked Indians with lies. By prophecy- Four Corners will be area of battle between White and Red. Indians will be pushed into Four Corners. 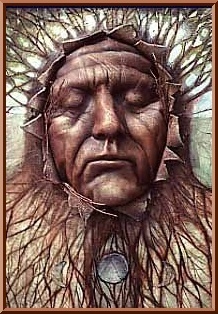 Great Spirit told Hopi Four Corners is the backbone of the US. Hopi must hold land until human beings live in harmony. The power under the land would be used for destruction. Be terrible punishment if were to give up the Four Corners. 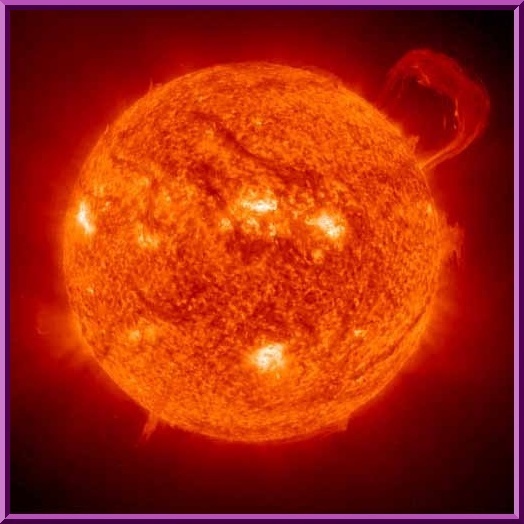 "The third event will depend upon the Red Symbol, which will take command setting the four forces of nature (Meha) in motion for the benefit of the Sun. When he sets these forces in motion the whole world will shake and turn red and turn against the people who are hindering the Hopi cultural life. To all these people Purification Day will come. Humble people will run to him in search of a new world, and the equality that has been denied them. His people will cover the Earth like Red Ants. We must Not go out and watch, we must stay in our houses. He will come and gather the wicked people who are hindering the red people who were here first. 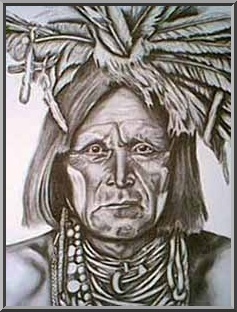 He will be looking for someone whom he will recognize by his way of life, or by his head (the special Hopi haircut) or by the shape of his village and his dwellings. He is the only one who will purify us. The Purifier, commanded by the Red Symbol, with the help of the Sun and Meha, will weed out the wicked who has disturbed the way of life of the Hopi, the true way of life on Earth. The wicked will be beheaded and will speak no more. This will be the Purification for all righteous people, the Earth, and all living things on Earth. The ills of the earth will be cured, Mother Earth will bloom again and all people will unite into peace and harmony for a long time to come." "But if this does not materialize, the Hopi traditional identy will vanish due to pressure from Bahanna. Through the whiteman's influence, his religions and the disappearance of our sacred land, the Hopi will be doomed. 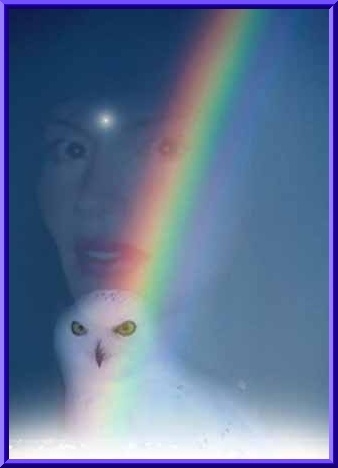 This is the Universal Plan, speaking through the Great Spirit since the dawn of time. The Hopi have been placed on this side of the Earth to take care of the land through their ceremonial duties, just as other races of people have been placed else-where around the Earth to take care of her in their own ways. Together, we hold the world in balance, revolving properly. If the Hopi nation vanishes, the motion of the Earth will become eccentric, the water will swallow the land and the people will perish. Only a brother and sister may be left to start a new life." "The Hopi creation myth depicts three chambers underground where animals develop into humans and progress upward, with the help of the Spider Grandmother. Then, she comes again, this time assisted by birds (the descent of the Deity into the field of time). Seven humans are shown ascending to the surface and sunlight. The entire shape is like a plant, with the leaves at the surface. In the beginning there were onl two, Tawa, the Sun God, and Spider Woman (Kokyanwhti), the Earth Goddess. All the mysteries and the powers in the Above belonged to Tawa, while Spider Woman controlled the magic of the Below. There was neither man nor woman, bird or beast, no living thing until these Two willed it to be. In time, they decided there should be other gods to share their labors, so Tawa divided himself and there came Muiyineuh, God of All Life Germs and Spider Woman divided herself and there came Huzruiwuhti, Woman of the Hard Substances (turquoise, silver, coral, shell, etc). Then did Tawa and Spider Woman have Great Thought, they would make the Earth to be between the Above and the Below. As Tawa thought the features of the Earth, Spider Woman formed them from the clay. At last they decided they had enough, then they made great magic and breathed life into their creatures. Now Tawa decided they should make creatures in their image to lord over all the rest. Spider Woman again formed them from clay. Again, the Two breathed life into their creations. Spider Woman called all the people so created to follow where she lead. Through all the Four Great Caverns of the Underworld she led them, until they finally came to an opening which led to the earth above. The Sun is the world's regulator. Its position in the sky determines the hours of the day and the seasons of the year. Ancient peoples worshiped it, planted and harvested their crops by the phases of the Sun. Stonehenge in Great Britain is composed of 30 upright stones, each over ten feet tall, aligned in a circle, with horizontal stones perched upon them. There is also an inner circle com-posed of similar stones. The construction of Stonehenge dates to between 5,000 and 3,000 years ago. 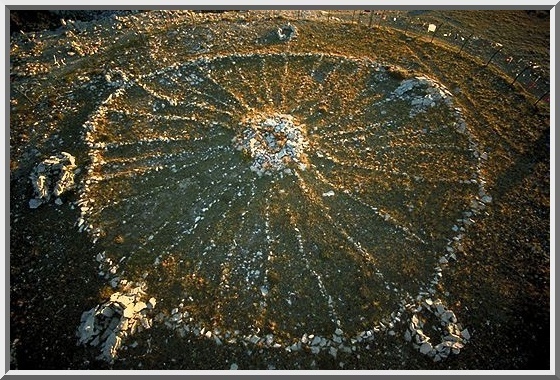 The rock outlines of the Bighorn Medicine Wheel near Sheridan, Wyoming is about ninety feet in diameter and possesses twenty-eight spokes. It was built by Native Americans around 1700 AD. Stonehenge in Great Britain and the Bighorn Medicine Wheel in Wyoming were both designed to identify important times in the Earth's orbit around the Sun. The Sun Dance was an important ritual for the North American Plains Indians. The Maya, Inca, Hopi, and Zuni Indians all have religious relics that show their regard for the Sun. According to ancient beliefs, the Japanese royal family is descended from their Sun Goddess, Amaterasu. 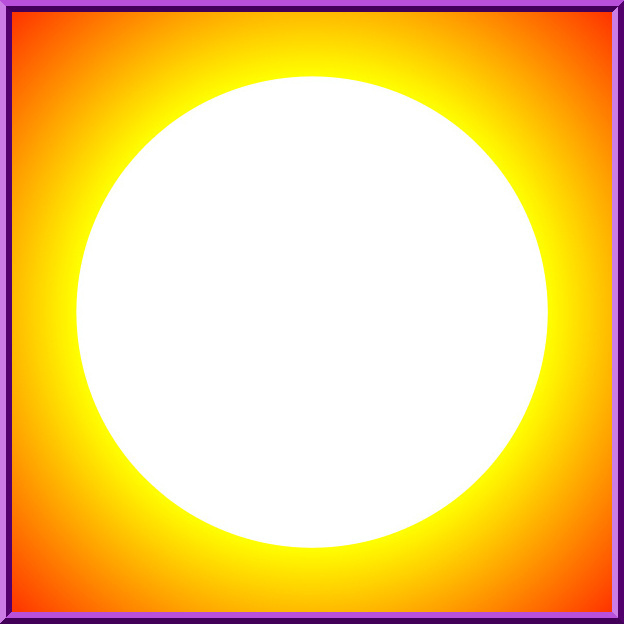 The Sun god is one of the principal deities in the ancient Hindu religion. Our concept of the twenty-four-hour day comes from Egyptian Sun worship. The Egyptian Sun God, Ra, traveled half the time through the twelve domains of the underworld and, half through the twelve domains of the day. Three thousand years before the birth of Christ, Egypt began using a 365 day calendar based on the solar year. In 46 BC, Julius Caesar replaced the Roman lunar calendar with a solar calendar modeled after the Egyptian calendar. Today, 5,000 years later, we still use a form of the Egyptan solar calendar. 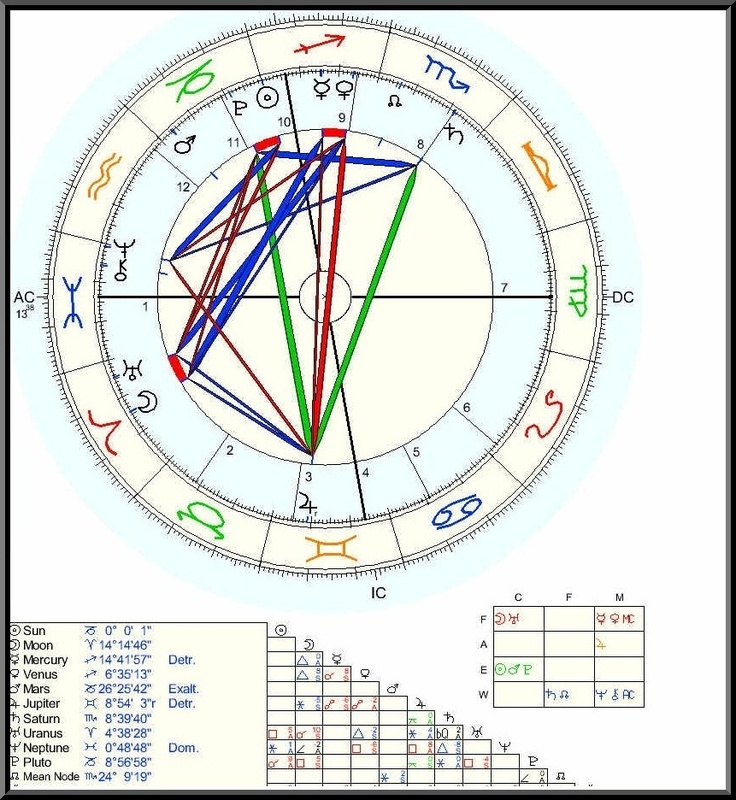 This focuses on the primary triad in ones birthchart; the Sun, Moon and the Ascendant. Interpretation of the birthchart begins with these three because they support every-thing else. This Triad forms the skeleton of character. astrology literally means "Star Language." 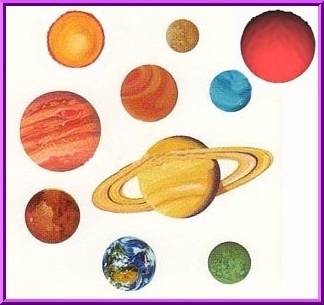 The language of ast-rology is made up of signs, houses, and planets. Each of these three factors describe a specific dimension of experience. The planets and angles of the birthchart (i.e. the ascendant) describe the What or the different functions and aspects of our character. The zodiac signs describe the How... that is, how we attempt to achieve the goals defined by the nature of each of the planets. 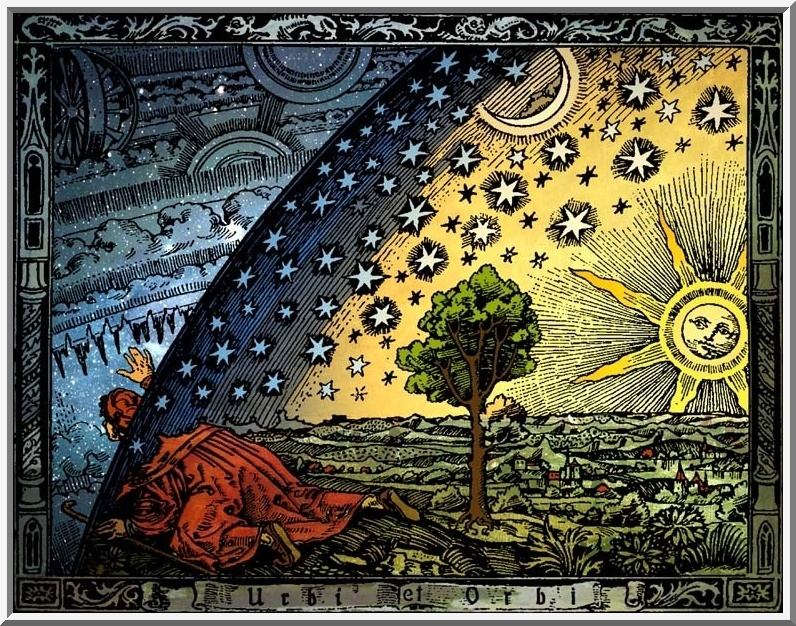 The houses describe the Where or the stage or arena of life in which all the planets develop and express themselves. 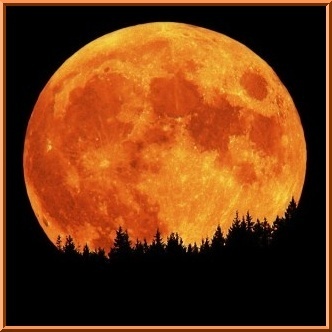 The Sun, Moon and Ascendant provide details concerning the question of What. When one examines the placements of the Sun and Moon, we are looking for clues to the functions and aspects of the character implied by the sign and house placement of the sun and moon, as is with the ascendant, which is not a planet but the most important angle of the birth chart. The ascendant's What is our expressed personality. It is the mask we wear as we present ourselves to the social world. A personality is a role we play and therefore, something that is less than what we are in our wholeness. It is via the ascendant that we are able to find a comfortable expression of our sun, moon and other planets in our chart. The WHAT, or the function of character we are working with when we examine the sun, is our fundamental identy or integrity. The sun in our charts is the gravitational center of our human personality. It is our innate desire to be and to realize our human self and our creative principle. The expression of our innate identity, described by our sun sign, is fundamental to our health, well-being and vitality. When it is the moon we are considering, the WHAT is our soul. It is our emotional nature and unconsciously acquired habits and instinctive reaction patterns. The moon is the fastest moving body in our solar system; changing as it passes from sign to sign and from phase to phase. It's function is to feel and respond. Each of us has the sun, moon and ascendant in one of the twelve zodiac signs and one of the twelve zodiac houses. When we think of ourselves and others only in terms of sun signs, we limit ourselves to a mere 12 cate-gorizations of character. If we add the moon sign, we extend the range of categories to include the 12 possible sun signs in combination with the 12 possible moon signs and increase the possibilities to 144. The possibilities jump to 1,728 when the twelve poten-tials for the ascendant, or rising sign are combined with the sun and moon combinations. Throw in the house placements of the sun and moon and the number jumps to 248,832. And that is achieved by a mere scratching of the surface of the symbology of the birthchart, using only the prime triad of character. The twelve signs are a combination of expressed energy that can be classified by their relationship to the four elements and three modes. You are likely familiar with the elements: Fire, Earth, Air and Water. The modes relate to the three phases or cycles of any life form: (1) birth, (2) continuity of existance and (3) transformation / death. In the language of astrology, the birth phase or initiating phase is referred to as the cardinal mode, the continuity of existence or maintenance phase is referred to as the fixed mode and the transformative phase or changeable phase is referred to as the mutable mode. Each sign of the zodiac is expressed through one of these three modal phases as well as one of the four elemental forces. Turning to the elemental forces, Fire is an active and forceful energy. The zodiac's fire signs, Aries, Leo, and Sagittarius are all signs representative of an energetic, passionate and asser-tive character because they are all signs representing the fire element. The earth signs, Tarus, Virgo and Capricorn, all demon-strate reliable, practical and sen-sual characteristics. The air signs, Gemini, Libra, Aquarius; endow one with a mental, com-municative and social character; and the water signs, Cancer, Scorpio and Pisces represent em-otional, sensitive and receptive traits. This is a simplified accounting of the modes and elements. An entire book has been written on the subject but the most important thing is, your understanding of these elements as you've experienced them in everday reality. 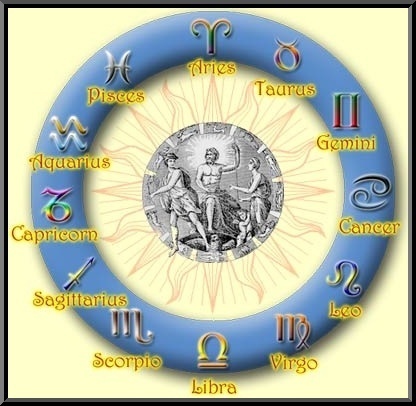 They will assist you in understanding their symbolical association to the twelve signs of the zodiac. Positive: Loves adventure, very energetic. Inventive with lots of courage, confident and enthusiastic. Sharp and quick-minded. Fiery and warm, passionate and expressive. Posesses a strong sense of urgency. Negative: Can be self-centered at times and prone to being quick-tempered. Impulsive and impatience, takes unnecessary risks. A procrastinator at times. Positive: Reliable with lots of patience. Extremely kind and loving. Strong determination and very security minded. Can be resentful and rigid. Greed and self indulgence issues. Positive: Very versatile and can adapt to anything. Positive: Loving and emotional. Shrewd and cautious. Sensitive and nurturing. Intuitive as well as imaginative. Broad-minded and expansive, faithful and loving. Positive: Modest and shy. Meticulous and reliable. Negative: Fussy and a worrier. Positive: Diplomaitic and urbane. Romantic and charming. Emotional and intuitive. Powerful and passionate. Jovial and good-humored. Honest and straightforward. Negative: Blindly optimistic and careless. Positive: Very resourceful but cautious. Very disciplined, res-erved and cool under fire. Practical and prudent. Ambitious and disciplined. Patient, humerous and reserved. Negative: Tendency to be selfish, unfeeling and calculating. Does not show sensitivity towards others and rigid emotions. Pessimistic and fatalistic. Miserly and grudging. Positive: Friendly and humanitarian. Likes to be different. Lively, honest and loyal. Orignal and inventive. Negative: Intractable and contary. Preverse and unpredictable. Positive: Imaginative and sensitive. Compassionate and kind.